The EJ200 started life in 1982 as the Rolls Royce/British MoD XG-40 Advanced Core Military Engine or ACME demonstrator. This programme, split into three phases; technology (1982-88), engine (1984-89) and assessment (1989-95) developed new fan, compressor, combustor, turbine (including high temperature life prediction) and augmentor systems using advanced materials and new manufacturing processes. The first full engine commenced rig testing in December 1986 with the final XG-40 running for some 200 hours during 4000 cycles bringing the programme to a close in June 1995. Upon formation of the EuroJet consortium in 1986 much of the continuing XG-40 research was used for the new programme. The requirements were for a powerplant capable of higher thrust, longer life and less complexity than previous engines. The result was a powerplant with similar dimensions to the Tornado's RB199 yet having almost half as many parts (1800 against 2845 for the RB199) and delivering nearly 50% more thrust. A very noticeable difference between the two engines can be seen by comparing the turbine blade designs. Compared to the RB199 the EJ200's blades are enormous and show leanings towards sustained transonic and supersonic flight profiles. The EJ200 is an advanced design based on a fully modular augmented twin-spool low bypass layout. The compressor utilises a three stage Low Pressure Fan (LPF) and a five stage High Pressure Compressor (HPC). The fan features wide-chord single crystal blade/disc (blisk) assemblies designed for low weight (including the removal of guide vanes), high efficiency operation. The three stages achieve a pressure ratio of around 4.2:1 with an air mass flow of some 77kg/s (or 170lb/s). Like the fan the five stage compressor also features single crystal blisk aerofoils. The use of single crystals and blade/disc units can both bring enormous potential advantages to how the powerplant may be operated (see fact box). Following the fan/compression stages fuel is injected via an annular combustor designed for low smoke operation. The key factors in determining jet engine efficiency and achievable work are the temperature and pressure differences attained between the engine inlet and combustor outlet. In the EJ200's case the outlet stator temperature is in excess of 1800K with a pressure ratio (achieved in just eight stages) of some 25:1. Such a high combustor temperature requires special precautions be taken with the High Pressure Turbine, or HPT which is directly downstream. To help reduce this problem the HPT uses air cooled single crystal blades. However there is a limit to what can be achieved using air cooling. In fact it eventually becomes detrimental to use cooling because it adversely effects the achievable combustion temperature and thus reduces efficiency. To overcome this the EJ200's HP turbine blades also utilise a special Thermal Barrier Coating, or TBC. This barrier is comprised of two plasma deposited layers, a special bonding coat over which a top layer of a Nickel-Chromium-Yttrium ceramic material is applied. Although this increases the life of the blade and increases the achievable operating temperature it does require regular inspection to ensure the coating remains viable. Following the single HPT is a further single Low Pressure Turbine (or LPT) stage again employing single crystal blades. In both the HPT and LPT a powder metallurgy disc is employed. A titanium alloy based mono-parametric convergent/divergent (Con-Di) nozzle completes the engine improving achievable thrust while helping to optimise the system for different flight profiles. 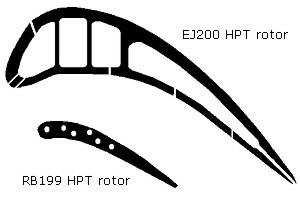 Overall the EJ200 employs a very low By-Pass Ratio (the ratio of air which bypasses the core engine or compressor stages) of 0.4:1 which gives it a near turbo-jet cycle. Such a low BPR has the benefit of producing a cycle where the maximum attainable non-afterburning thrust makes up a greater percentage of total achievable output. At its maximum dry thrust of 60kN (or 13,500lbf) the EJ200's SFC is in the order of 23g/kN.s. With reheat the engine delivers around 90-100kN (or 20,250-22,500lbf) of thrust with an SFC of some 49g/kN.s. Compared to other engines these figures may actually seem relatively high, however such data must be used with caution and evaluated with all other performance data to be of any use. With reheat the engine weighs just 2286lb giving a Thrust to Weight Ratio of around 9:1. An interesting point to note is that the baseline production engine is also capable of generating a further 15% dry thrust (69kN or 15525lbf) and 5% reheat output (95kN or 21263lbf) in a so called war setting. However utilising this capability will result in a reduced life expectancy. Much is currently being made about supercruise, that is the ability to cruise supersonically without the use of reheat (afterburn) for extended periods of time. Although never stated explicitly (as for example with the U.S. F-22) the Typhoon is capable of and has demonstrated such an ability since early in its flight program according to all the Eurofighter partnets. Initial comments indicated that, with a typical air to air combat load the aircraft was capable of cruising at M1.2 at altitude (11000m/36000ft) without reheat and for extended periods. Later information appeared to suggest this figure had increased to M1.3. However even more recently EADS have stated a maximum upper limit of M1.5 is possible although the configuration of the aircraft is not stated for this scenario (an essential factor in determining how useful such a facility is). The ability to maintain transonic and supersonic flight regimes without resorting to the use of reheat is achieved mainly thanks to the advanced materials and design of the EJ200. For times when a quick sprint is required the Typhoon can employ reheat with an upper (design) limit of Mach 2.0. Since the first EJ200 ran in 1991 some 14 development engines have been constructed. The first three plants were for design verification amassing some ~700 hours of bench test time. Another 11 engines were then constructed and placed in Accelerated Simulated Mission Endurance Testing, or ASMET. These prototypes (designated EJ200-O1A) were used to verify the engine design and reliability. During this stage the first two Development Aircraft, DA1 and DA2 entered flight testing. Since the EJ200 had not been certified for flight these first two aircraft were equipped with Tornado ADV class Turbo-Union RB199-104D engines (the D signifies the removal of the thrust reversal buckets). These have have a significantly lower dry thrust, some 42.5kN, than the EJ200 but are approximately the same size. In mid-1998 these RB199's were replaced with EJ200-03A models (see below). So far over 10000 hours of combined rig testing have been achieved of which some 2800 hours were in altitude testing facilities. In addition the EJ200 has completed well over 650 real flights in the various Development Aircraft from sea level to 15000m (50000ft) and from 135kts through M2.0. The first Eurofighter to receive the (flight certified) EJ200-01A was the Italian DA3 in 1995 with its first flight in June of that year. The remaining development aircraft also use the EJ200 powerplant (both the EJ200-01A and 01C), but the DA3 remains the primary engine integration aircraft. The DA3 has been used for testing not only the EJ200 itself, but also the Full Authority Digital Engine Control (FADEC) system and Auxiliary Power Unit (APU). In April 1997 EuroJet completed and obtained flight certification on the full pre-production model engine, the EJ200-03A. In January 1998 EuroJet signed production and production investment contracts with NETMA for some 1500 engines worth around DM12.5B covering the basic order of 620 Eurofighter's. Following this in January 1999 EuroJet received official orders for the first 363 engines to equip the 148 Tranche-1 Typhoon's as well as providing a number of spares. In June 1999 EuroJet obtained flight clearance for the final production standard powerplant with production release scheduled to occur by the end of 1999. The first two production engines were handed over to BAE on the 12th July 2001 at Rolls Royce's Filton plant in Bristol. They were subsequently integrated into IPA1, the first production Eurofighter, at BAE's Warton facility.